The Sailor Quartet came into themselves well into the era of peace in Crystal Tokyo, the Neo-Silver Millennium. They awoke after the Black Moon threat and, while they did appear at Sagittarius Zero Star to see the end and the beginning of the Galaxy Cauldron and Eternal Sailor Moon’s fight against Galaxia and Chaos, they didn’t actually get to do much of the fighting. They find themselves in an era without need for senshi, with the previous generation of guardians around and completely capable of dealing with any evil force that enters the Solar System. … all and all, they don’t know where they fit. They were revived by Neo Queen Serenity to help fight, but there is nothing to fight. They feel lost and useless in this future, simply biding their time with lessons until they find some overall purpose. 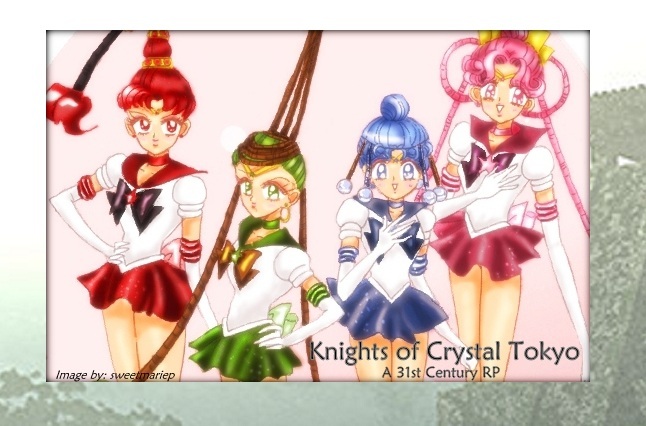 The Galilean Knights, four young men charged with the protection of Princess Jupiter, awaken for the first time since the Silver Millennium, younger and less experienced then they remember being, and accompany Eternal Sailor Jupiter to Earth to train under her, alongside the Sailor Quartet, to regain their former prowess. The four have a driving need to protect and fight evil, and so have been tagged as “foster senshi,” to be part of the program Princess Kakyuu put in place for the planets that have yet to have guardian senshi reborn after the fight against Galaxia. Once their training is complete, they will be sent off to a planet in need of their services, and while it is an exciting prospect, the teenagers are unsure as to their true feelings about the situation. Some time into the joint training of the Quartet and Knights, a small disturbance in Central America calls for the presence of Sailor Senshi and the senshi-in-training beg to be sent there, to prove that they can take care of problems for themselves. The request was granted, but when they arrive, what was thought to be a simple uprising of an immoral leader turns out to be the embodiment of the blood-thirsty gods of the ancient Olmec and Aztec mythology. Trapped in a sacred pyramid in the middle of a long-forgotten forest, the Quartet and Knights must work together and pull from all aspects of their training to survive and conquer this evil… and save the world. [center][table border="1"][tr][td][url=http://crystaltokyoknights.forumotion.com][center][img]http://i47.servimg.com/u/f47/16/87/03/41/elcast10.jpg[/img][/center][/url][/td][/tr][tr][td][size=10][center]The Sailor Quartet came into themselves well into the era of peace in Crystal Tokyo, the Neo-Silver Millennium. They awoke after the Black Moon threat and, while they did appear at Sagittarius Zero Star to see the end and the beginning of the Galaxy Cauldron and Eternal Sailor Moon’s fight against Galaxia and Chaos, they didn’t actually get to do much of the fighting. They find themselves in an era without need for senshi, with the previous generation of guardians around and completely capable of dealing with any evil force that enters the Solar System.